The rates at which Aboriginal and Torres Strait Islander people are experiencing violence and being put in prison has reached a crisis point. It doesn't have to be this way. We can change the record. ANTaR is a founding member of the Change the Record Campaign launched April 2015. Change the Record is a national campaign to address the disproportionate rates of incarceration of Aboriginal and Torres Strait Islander people and the high levels of violence experienced, particularly by woman and children. In the past 10 years we have seen an 88% increase in the number of Aboriginal and Torres Strait Islander people ending up in prison, with Aboriginal and Torres Strait Islander people now 13 times more likely to be imprisoned than non-Indigenous people. Being placed in prison is all too common for Aboriginal and Torres Strait Islander people. But the impact of being in prison can be severe - not just for the individual but also for their family and the whole community. At the same time, Aboriginal and Torres Strait Islander people – especially women and children – are experiencing increasing amounts of violence with Aboriginal and Torres Strait Islander women 34 times more likely to be hospitalised as a result of family violence. This is devastating lives. But it doesn't have to be this way. We can change the record. We need to invest in early intervention, prevention and diversion strategies. These are smarter solutions that increase safety, address the root causes of violence against women, cut reoffending and imprisonment rates, and build stronger and safer communities. We can do this and reduce the cost for all of us as taxpayers. Many of the solutions are already there. Now we need to make it happen, and do so in a way that empowers Aboriginal and Torres Strait Islander people, communities and services to drive these solutions. Together, we can change the record. Together, we can build stronger and safer communities. How do we change the record? To Change the Record, we need to work with Aboriginal and Torres Strait Islander communities to invest in holistic early intervention, prevention and diversion strategies. These are smarter, evidence-based and more cost-effective solutions that increase safety, address the root causes of violence against women and children, cut reoffending and imprisonment rates, and build stronger communities. Find out more about what's needed to change the record. The Change the Record Campaign is a coalition of leading Aboriginal and Torres Strait Islander, community and human rights organisations referred to as the National Justice Coalition. Members include Aboriginal and Torres Strait Islander Social Justice Commissioner, Mick Gooda; Amnesty International Australia; ANTaR; Australian Council of Social Service; Federation of Community Legal Centres (Vic); First Peoples Disability Network; Human Rights Law Centre; Law Council of Australia; National Aboriginal and Torres Strait Islander Legal Services; National Aboriginal Community Controlled Health Organisations; National Congress of Australia’s First Peoples; National Family Violence Prevention Legal Services Forum; Oxfam Australia; Secretariat of National Aboriginal and Islander Child Care; Sisters Inside; Victorian Commissioner for Aboriginal Children and Young People, Andrew Jackomos. KPMG Maranguka Justice Reinvestment Project Impact Assessment. This report outlines the findings into the changes in Bourke during 2017.
imprisonment by adopting the Change the Record Campaign’s National Plan of Action Free to Be Kids, launched at a Sea of Hands installation in front of Federal Parliament today. 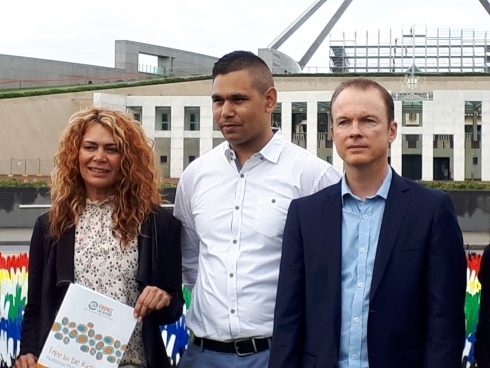 On Monday 27 November outside Parliament House in Canberra, ANTaR and the Change the Record Campaign launched the Free to be Kids Plan of Action to tackle the over-imprisonment of Aboriginal and Torres Strait Islander Youth. Read ANTaR's Submission to the Australian Law Reform Commission Inquiry into Incarceration Rate of Aboriginal and Torres Strait Islander Peoples. National advocacy organisation for Aboriginal and Torres Strait Islander rights, ANTaR, today called for immediate action to address the systemic and individual failures in the justice system, in light of the Ms Dhu Coronial Inquest findings. ANTaR National Director Andrew Meehan, said he was deeply disturbed by the video footage showing the inhumane treatment of Ms Dhu, and that the findings of the Inquiry demonstrate that urgent action is required to prevent such cases occurring again. ANTaR, today welcomed the Federal Government’s announcement of an inquiry into the appalling incarceration levels forFirst Peoples in Australia.The inquiry has been tasked to the Australian Law Reform Commission which will examine the factors leading to the over representation of Aboriginal and Torres Strait Islander people in the prison system, and consider reforms to reduce that representation.ANTaR National Director Andrew Meehan said that the announcement is welcome but he emphasised the need to engage with First Peoples representatives on the terms of reference, including to consider extending them to look at prevention of family violence. Learn more from ANTaR's full media release. ANTaR, national advocacy organisation for Aboriginal and Torres Strait Islander rights, today called on all governments to listen to First Peoples in order to address crisis levels of incarceration of Aboriginal and Torres Strait Islander young people. “Its about time governments started to listen,” she said. Last night’s episode of ABC’s Four Corners featuring one of the first Justice Reinvestment trial sites in Australia, highlighted the common sense approach that Justice Reinvestment supports. Learn more from ANTaR's full media release. National Advocacy organisation for Aboriginal and Torres Strait Islander rights, ANTaR, tonight called for the Royal Commission into the Child Protection and Youth Detention Systems of the Northern Territory to be expanded to cover all jurisdictions across the country, and for the Optional Protocol to the Convention Against Torture (OPCAT) to be urgently ratified by the Australian Government. National Aboriginal and Torres Strait Islander rights advocacy organisation, ANTaR today called for the Prime Minister and Federal Government to start engaging with, and listening to First Peoples before making decisions. National advocacy organisation for Aboriginal and Torres Strait Islander rights, today expressed dismay that the Federal Government hadn’t listened to Aboriginal and Torres Strait organisations on the Royal Commission in the Northern Territory. ANTaR National Director Andrew Meehan said that the Prime Minister had disappointed the sector following what was initially a positive response to the horrific scenes showing abuse at the Don Dale Youth Detention Centre in the Northern Territory. Over 100 organisations release statement calling for Royal Commission to be independent, and broader in scope. Today over 100 organisations, including Aboriginal and Torres Strait Islander peak representative bodies, have released an Open Statement welcoming Prime Minister Turnbull’s Royal Commission into the horrific abuse of children in the Northern Territory, but calling for it to be conducted independently from the NT Government and for a broader inquiry into the youth justice system as a whole. Call for the Royal Commission to be conducted completely independently from the Northern Territory Government and for a broader inquiry into the youth justice system. ANTaR, national advocacy organisation for Aboriginal and Torres Strait Islander rights, today called for Aboriginal and Torres Strait Islander youth incarceration across the country to become a priority for the Federal Government. ANTaR National Director Andrew Meehan said that he was astounded at reports that the Federal Minister for Indigenous Affairs had commented that his ‘interest wasn’t piqued’ prior to Monday’s Four Corners program on youth detention in the Northern Territory. National advocacy organisation for Aboriginal and Torres Strait Islander Affairs, ANTaR today called for the sacking of Northern Territory Minister for Corrective Services, Justice, Families and Children, John Elferink following harrowing footage of abuse of young people in detention at Don Dale youth detention centre. Today, on the 25th anniversary of the release of the Royal Commission into Aboriginal Deaths in Custody Report, national advocacy organisation for Aboriginal and Torres Strait Islander rights – ANTaR, called for an end to government indifference to addressing the nationwide incarceration crisis facing Aboriginal and Torres Strait Islander peoples. Today the Change the Record Coalition welcomed the release of the report and recommendations of the Victorian Royal Commission into Family Violence (Royal Commission). The report provides 227 recommendations aimed at addressing and preventing family violence, and includes an important focus on the disproportionate impact of family violence on Aboriginal and Torres Strait Islander women and children. The Blueprint urges a whole of government strategy, the setting of justice targets, and a commitment to work in partnership with Aboriginal and Torres Strait Islander communities, their organisations and representatives to drive solutions. This Blueprint is the result of more than two years of collaboration between 16 leading peak Aboriginal and Torres Strait Islander bodies, legal organisations and human rights groups. It urges a whole of government strategy, the setting of justice targets, and a commitment to work in partnership with Aboriginal and Torres Strait Islander communities, their organisations and representatives to drive solutions. ANTaR, national advocacy organisation for Aboriginal and Torres Strait Islander rights, today called on all sides of politics to listen and act on what First Peoples have called for on justice. The call comes after the Opposition Leader Bill Shorten delivered a speech in Melbourne last night outlining the Labor Party’s approach to justice, including committing to setting targets to close the justice gap. Today the Change the Record Coalition urged Governments to take critical leadership to address the rising Aboriginal and Torres Strait Islander imprisonment crisis. The call for action has come with the release yesterday of the most recent NSW custody statistics which show a staggering increase in the number of Aboriginal and Torres Strait Islander in prisons, with an 18 per cent increase since October last year and a 20 per cent increase over the last two years. Coalition Co-Chair Shane Duffy said the report shows that not only are the rates of Aboriginal and Torres Strait Islander people incarceration at crisis levels, the gap between Aboriginal and Torres Strait Islander and non-Indigenous Australians is growing in NSW. Aboriginal and Torres Strait Islander rights organisation ANTaR joined with coalition partners today to launch a new campaign to change the appalling rates of Aboriginal and Torres Strait Islander peoples’ imprisonment and experience of violence. The ‘Change the Record’ campaign is calling for a new approach that focuses on early intervention, prevention, and diversion strategies that address the root causes of violence and imprisonment. To Change the Record, we need to work with Aboriginal and Torres Strait Islander communi-ties to invest in holistic early intervention, prevention and diversion strategies. These are smarter, evidence-based and more cost-effective solutions that increase safety, address the root causes of violence against women and children, cut reoffending and imprisonment rates, and build stronger communities. Here is our list of what needs to be done. ANTaR today welcomed the reversal of funding cuts to Aboriginal and Torres Strait Islander Legal Services (ATSILS) and called for longer term certainty for the vital sector. 26 Aboriginal and Torres Strait Islander, health, community, and legal peak organisations write an open letter to the PM to request an urgent reversal of the proposed funding cuts to legal assistance services under the Attorney General’s portfolio, including Aboriginal and Torres Strait Islander Legal Services (ATSILS), its peak body National Aboriginal and Torres Strait Islander Legal Services (NATSILS), Community Legal Centres (CLCs) and the Legal Aid Commissions (LAC). A group of leading Aboriginal and Torres Strait Islander, community and human rights organisations meeting in Sydney today have called for national leadership to address the crisis levels of incarceration of Aboriginal and Torres Strait Islander people and create safer communities. National Aboriginal and Torres Strait Islander rights advocacy organisation ANTaR today called on government to act on unacceptable incarceration rates of Aboriginal and Torres Strait Islander people. National Director Andrew Meehan said that there had been report after report highlighting the urgent need to address incarceration, and government couldn’t bury its head in the sand on the issue. The over representation of Aboriginal and Torres Strait Islander people in the criminal justice system is one of the most significant social justice issues facing Australia. Read more about it. Download our fact sheet. It’s now time government acted on its commitment to set a destination and chart the course to get us there in relation to incarceration and to do so with Aboriginal and Torres Strait Islander people. Government should put this issue on the COAG agenda as a matter of urgency and work towards the development of justice targets. It must meet its commitment on setting targets to reduce incarceration. Parliamentarians, Aboriginal leaders, and community members will gather in the NSW Parliament House on Wednesday evening to discuss a new approach to reducing Aboriginal incarceration rates. The Reconciliation in Parliament event is a yearly forum hosted by ANTaR and the NSW Reconciliation Council to engage parliamentarians from across the political spectrum on reconciliation and addressing Aboriginal disadvantage in NSW. ANTaR supports the calls made today by the National Aboriginal and Torres Strait Islander Legal Services (NATSILS) and the National Congress of Australia’s First Peoples for the Governments of Australia to adopt Justice Targets. The proposed defunding of the peak body for Aboriginal Legal Services would undermine the Abbott Government’s efforts to improve education and employment for Aboriginal people, according to ANTaR. ANTaR National Director, Gary Highland said that defunding the National Aboriginal and Torres Strait Islander Legal Services (NATSILS) would lead to more Aboriginal people going to prison and undermine efforts to improve Aboriginal community safety. In this submission ANTaR discusses the unacceptable over representation of Aboriginal and Torres Strait Islander peoples in our prison system and the drivers of this imprisonment rate. We raise serious questions about the economic and social cost of imprisonment in the face of what appears to be an ineffective measure to reduce crime and make safer communities. We put forward Justice Reinvestment as a positive policy solution, defining this approach and the purported economic and social benefits of reinvesting justice funds using examples in the US and the UK to support these claims. We support the recommendations put forward by the National Aboriginal and Torres Strait Islander Legal Services to progress the implementation of a justice reinvestment approach in Australia. ANTaR welcomes the passage of a motion for a parliamentary inquiry into Justice Reinvestment as a milestone in the campaign to reduce Aboriginal and Torres Strait Islander imprisonment rates. people in prisons and create safer communities. Responding to the release of the coronial report into the death of Kwementyaye Briscoe, ANTaR and the National Police Accountability Network highlight the need for major changes to prevent future deaths in custody. Delivering the 25th Lionel Murphy lecture last night, the Attorney-General Robert McClelland acknowledged that over-imprisonment causes more crime than it prevents and affirmed the need for all governments to work together to address the social causes of crime. The National Director of ANTaR says a report released today confirms the urgent need for governments to reduce the disproportionate number of Aboriginal and Torres Strait Islander people being imprisoned. Read ANTaR's National Call to Action, issued on the 20th anniversary of the Royal Commission into Aboriginal Deaths in Custody handing their Final Report to the Governor-General. A wide range of community organisations have endorsed a Call to Action aimed at dramatically reducing the over-representation of Aboriginal and Torres Strait Islander people in our jails. In this submission, ANTaR makes a series of recommendations designed to achieve a reduction in the number of Aboriginal and Torres Strait Islander young people in custody and build the strength and capacity of local communities, including a national justice reinvestment approach. ANTaR welcomes the Greens launch today of its ‘Justice Reinvestment’ initiative and challenges all major parties to commit to the national rollout of Justice Reinvestment strategies in cooperation with State and Territory Governments.